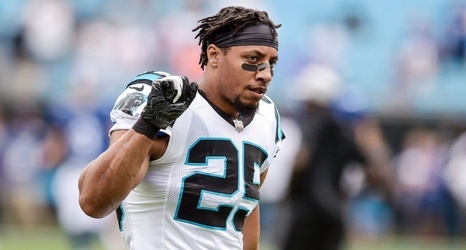 PITTSBURGH -- Carolina Panthers free safety Eric Reid was ejected in the third quarter of Thursday night's game for targeting the Pittsburgh Steelers' Ben Roethlisberger as the quarterback was sliding at the end of a 17-yard scramble. Reid became the ninth player to be disqualified this season with the NFL cracking down on targeting. Reid lowered his head with Roethlisberger already well into his slide and delivered shoulder-to-helmet contact to the six-time Pro Bowl selection. The play came with 1:03 left in the third quarter and the Steelers driving for a touchdown that would make it 45-14.